After walking by this drawing multiple times each day, this afternoon I stopped and really looked closer at this deceptively simple drawing. At first glance it is straightforward enough: a common metal desk lamp drawn with charcoal and white Conté crayon. 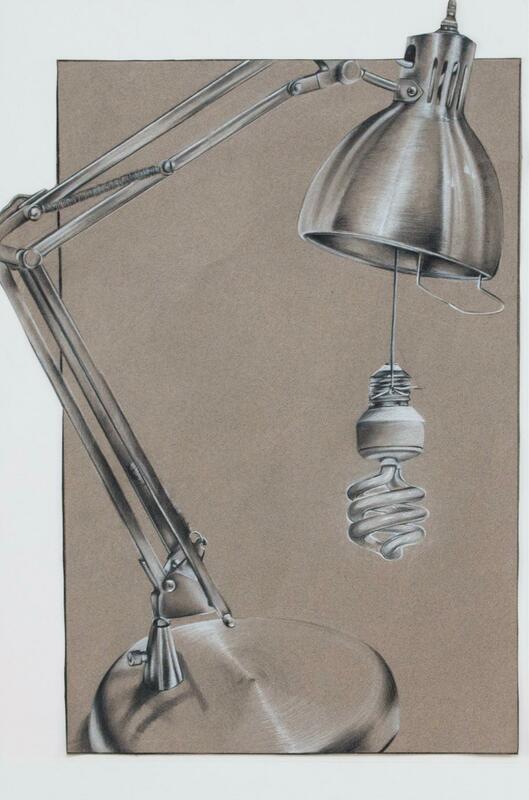 The toned paper works as both background and the middle value in the rendering of the lamp, creating a warm undertone. Dangling by a wire from the lampshade is a CFL bulb. Looking closer, I notice how the details of the lamp are rendered so convincingly -- the sheen of the brushed metal, the screws holding the lamp together, the coiled wire, the spirals of the almost opaque glass bulb – that I never questioned the oddity of the dangling bulb. Adding more interest is the fact that while drawn with traditional materials Allison’s piece nevertheless breaks boundaries as the lamp pops out of the frame on two sides. There are those moments with an artwork where the work pulls you in. You gravitate to it and wonder what is really happening? After taking a closer look at this painting I realized I was taking a closer look at myself as to why I gravitated to this painting which makes me smile and feel content. Was it the surrealist style? The perspective of the men within the painting? The focus of the pink balloon that directs your eye to a man handing over a balloon to a child? Is it the background depicting Los Angeles with palm trees, power lines and a billboard? Are the men at work, vending what looks like to me pan dulce, flowers, posole or are they at home having a good time? Who are these different generation of men? 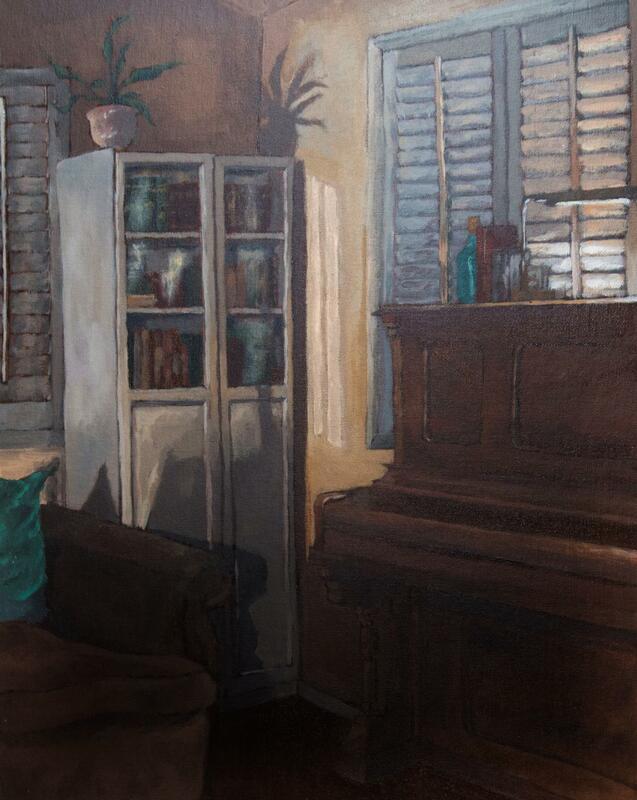 After all these questions I realized, I take pleasure in this painting simply because it celebrates my home. This painting brings light to the Los Angeles community, specifically Latino men in a positive light that needs to be shared and appreciated. The intensity of the girl’s expression feels pure, seemingly filled with lived experience and curiosity. 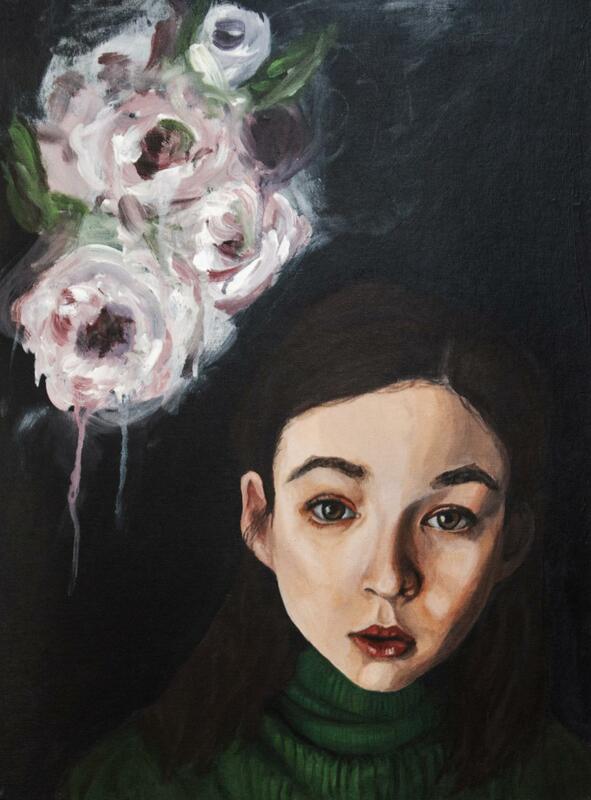 The artist depicted her with so much realism that the technique used on the flowers seems to hint at something growing or forming in her mind – like something still being realized. Who is she carrying on her back? What or who does the black and white figure represent? Some burden the in-color figure is carrying in life? Maybe her own grief from some loss, her own depression, or the weight of the world in which we live? Maybe it’s regret? This is a beautifully executed work by Ana Wong that invokes much contemplation. 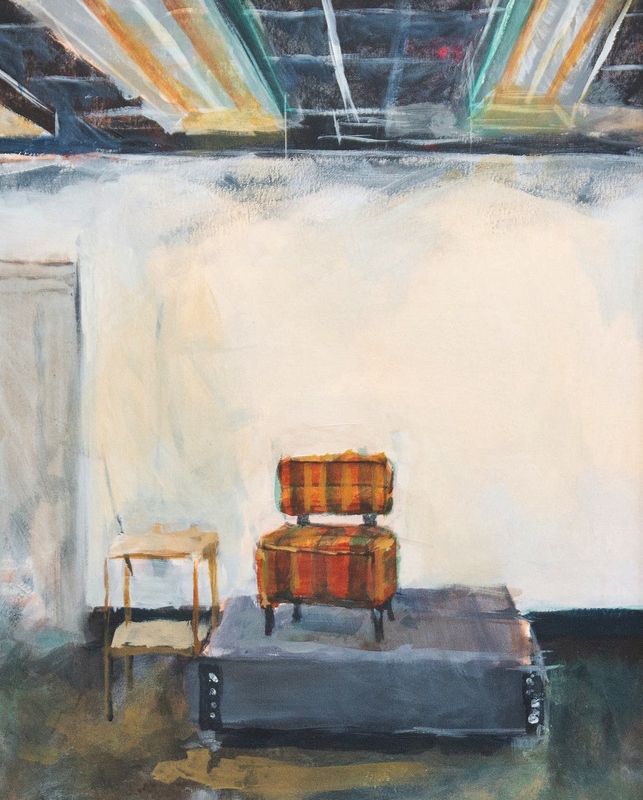 Surrounded by muted tones of the walls and furniture, the painting of an interior space produces a sense of familiarity and comfort, as though the corner of this room comes from the viewer’s own memory. The play of warm light gently moving around the walls, the cabinet, and the top of the piano adds to this sense of coziness. And although there are many object in the space, the hints of green and teals, contrasting the brown and beiges, directed the viewer’s sight in a circular motion around the each piece of furniture without confusion or clutter. Along with the closed window, the image seems to suggest that in this interior space, this corner of a safe living room, you belong. 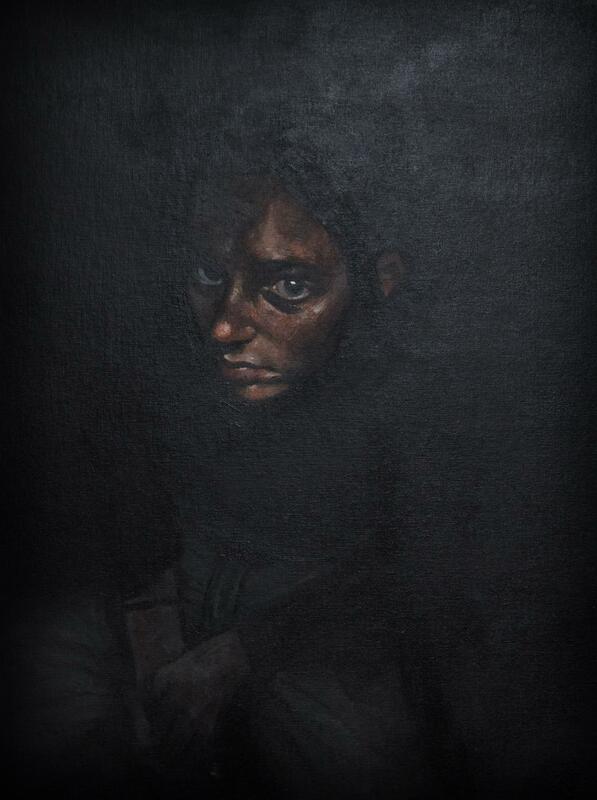 The dark composition of this piece brings an instant notice of the girl sitting alone. As she holds her own hands in her lap and gazes up to the audience, it brings wonder as to why she sits alone in the dark with a serious, but tired expression. This little painting didn’t jump out at me at first, but now the more I see it, the deeper an impression it makes. I was just thinking today how the chair on the model stand, meant to be a seat for the model, in this case is a stand-in for the figure. The model stand and the model’s prop is the center of focus, for once. Just think of how many drawings and paintings that model stand and chair have been in, they deserve a painting of their own! 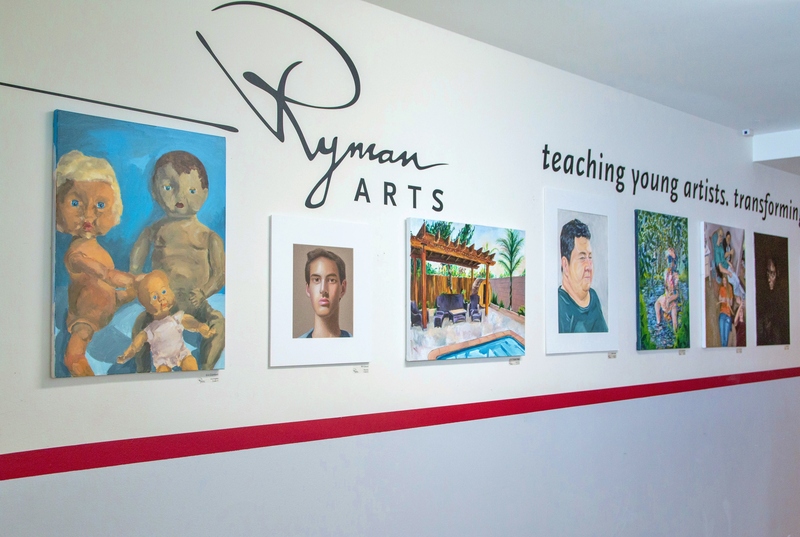 I’ve spent so many Saturdays in room D160 in Cal State Fullerton; this painting really captures the feeling of that quintessential artist’s studio classroom. If I saw it again 50 years from now I know it would immediately make me nostalgic for those Ryman Arts Saturdays. This painting reminds me of Saturday mornings when chores would start for everyone in the house, or evenings when my mom came home from work and started dinner. The lighting makes the painting look very peaceful and highlights the woman further, despite her already being in the center of the canvas. I think the artist managed to make something as simple as dish washing look beautiful.